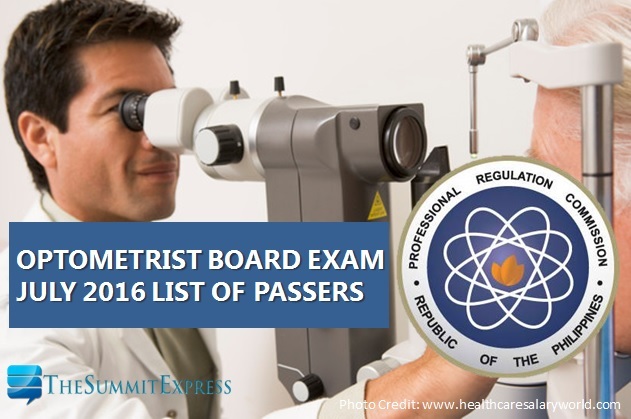 Those awaiting results of July 2016 Optometrist board exam can find here the complete list of passers, top 10 (topnotchers), top performing schools and performance of schools as the Professional Regulation Commission (PRC) and the Board of Optometry released results in 3 working days after the last day of exam. A total of 112 out of 131 passed the Optometrist Licensure Examination, PRC said on Wednesday, July 27. PRC has administered the written examination on July 18, 19, & 20 and practical exam on July 21 and 22 in Manila. The theoretical examination covered major subjects such as ocular pharmacology, visual biology, physiological optics, binocular vision and perception (Day 1); primary care and refraction, practical, theoretical optics and opthalmic dispensing (Day 2); jurisprudence, ethics and practice management, ocular diseases and clinical optometry (Day 3). The practical test was subdivided into objective examination (20%), subjective examination (20%), opthalmic lens laboratory (20%), clinical optometry (20%) and contact lens practice (20%). From August 1 to August 2, 2016, registration for the issuance of Professional Identification Card (ID) and Certificate of Registration will be done on-line. Please go to http://www.prc-online.com/ and follow instructions for initial registration. Those who will register are required to bring the following: duly accomplished Oath Form or Panunumpa ng Propesyonal, 2 pieces passport size picture (colored with white background and complete name tag) and 2 sets of documentary stamps. Successful examinees should personally register and sign in the Roster of Registered Professionals. Like us on Facebook, Follow Us on Twitter to receive real time updates. You may also subscribe via email.